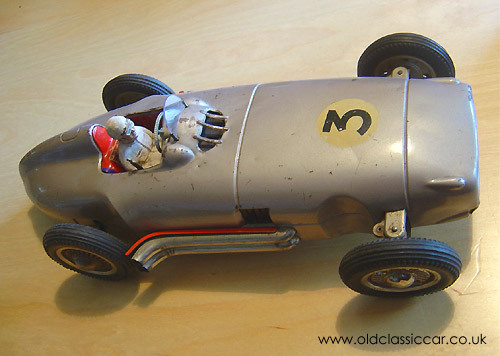 This is the only example of this toy Mercedes that I have come across, and is loosely based on the mid 1950s W196 (open wheel spec) Grand Prix car, of the type that Stirling Moss won the '55 Aintree meeting in (ahead of team-mate Juan M. Fangio). I'm told that most examples of this large toy are powered by a wind-up, clockwork, motor. This one is the scarcer type, and is propelled by a battery powered motor. Inside the cockpit is a 'gear lever' that allows you to select neutral, reverse, and one of two forward speeds. Manufacturer is not known, but will be one of the major tinplate toy producers from postwar Germany. The driver is not the original, but one I found that fits almost perfectly. The interior lithography shows the correct tartan trim that these W196s were trimmed with, and the dashboard is very detailed. The steering wheel also controls the front wheels.